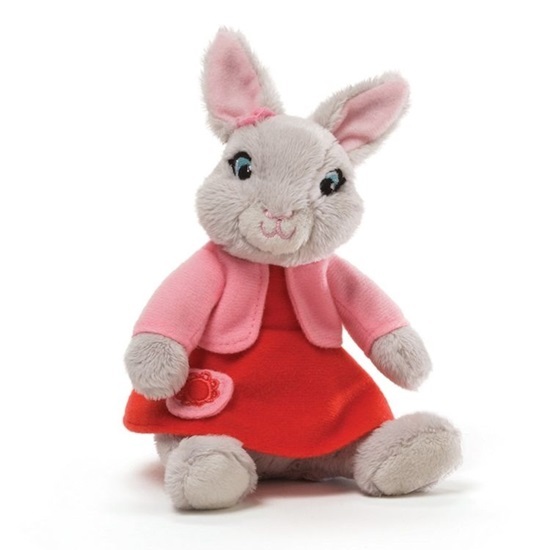 From the 2014 Peter Rabbit series on Nickelodeon..
New in 2014 from GUND, we are pleased to share "Lily Bobtail" a soft plush beanbag bunny based on the new hit television show from Nickelodeon. This is a 6-inch soft plush gray bunny. The insides of her ears are a soft pink velour. She is wearing her classic red dress with a pink sweater, and a pink flower sits just below her right ear. A pink pocket with a red flower is stitched on the right front of her dress. Peter Rabbit is a rich and beautiful CG-animated, re-telling of Beatrix Potter's timeless classic children's stories from the early 1900s. The show follows our hero, Peter--a brave, mischievous, impulsive and resilient little rabbit. Peter is also brash and charismatic and possesses a quicksilver intelligence; he encounters real dangers, and he and his loyal friends and family must use their wits to outsmart incompetent villains whose barks are way worse than their bites. This practical, quirky bunny is most at home following her passion of reading. Her unquenchable thirst for knowledge and an innate curiosity leads her to be more methodical in her approach to adventures than Peter. Her logical approach and patient attention to detail can help her friends see something vital others might have missed.